The paper by Anders Jerkstrand et al. LONG-DURATION SUPERLUMINOUS SUPERNOVAE AT LATE TIMES, (Jerkstrand A. et al. The Astrophysical Journal, Volume 835, Issue 1, article id. 13, 23 pp. 2017), contains spectra from ESO (VLT + FORS2, VLT + Xshooter, NTT + EFOSC2) for three superluminous supernovae at late times. LSQ14an and SN2015bn/PS15ae were PESSTO follow-up targets. The scaling and corrections are described in the paper. 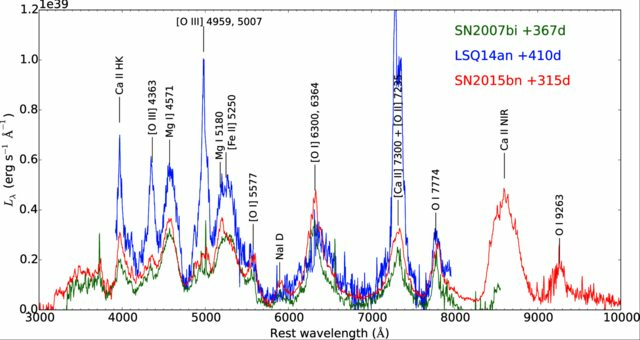 Here we release the various spectra, including our calculated host galaxy spectra, and a detailed README file to describe each of the data products available. When using these data, please cite the Jerkstrand et al. paper, and also (if using 2007bi data) the Gal-Yam et al. (2009) paper as the original data source. The data are also available through WISeREP.